We work closely with your family philosophy to give your child the unique and specialized care that they deserve. We have a team approach to treating all of our young patients. Our referring dentists, hygienists, parents and patients are all part of The Smile Team! We encourage parents to participate in promoting a positive attitude towards dentistry and healthy dental habits for the whole family! We are always accepting new patients – no referral needed! We would love to meet with you and your child as early as the age of 6 months. Early visits allow us to get to know you and your child and help you stay educated and prepared for all the changes that occur in children's mouths. The most affordable and easiest way to manage dental issues is to prevent them in the first place. 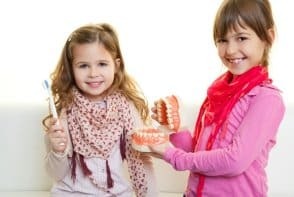 In the event that we do need to complete restorative treatment, your child is coming to a familiar and friendly place and will often be better able to handle the stress and anxiety that comes with many procedures. Cavities are the most common infectious disease in Canadian children. Why should I go see a pediatric dentist? Every team member at The Smile Team loves to work with children. We understand how intimidating visiting the dentist for the first time can be for children. For this reason, we strive to have a welcoming, comfortable and fun office for you and your children. Prior to your child's first visit, please feel free to call us and any one of our team members can help alleviate any concerns that you may have about coming to see the dentist. What happens at the first visit in your clinic? Our doctors will do a dental exam to see if there are any signs of weak enamel as cavities progress very fast in baby teeth. Diagnostic radiographs will be taken at the age of three or if necessary prior to that age. The team will go over diet and oral hygiene in depth to make sure your child is getting the optimal care for teeth. If there is treatment to be done, we will coordinate a comprehensive treatment plan for your child. We are pleased to direct bill to most insurance plans. Different sedation options such as laughing gas, conscious sedation and general anesthesia are offered to tailor your child’s treatment plan.